In the first shareholders meeting Wednesday since a 50:1 stock split in May last year, Samsung’s chief executives vowed better performance with technological leads in 5G and artificial intelligence, while some shareholders strongly lambasted the constantly low share price. 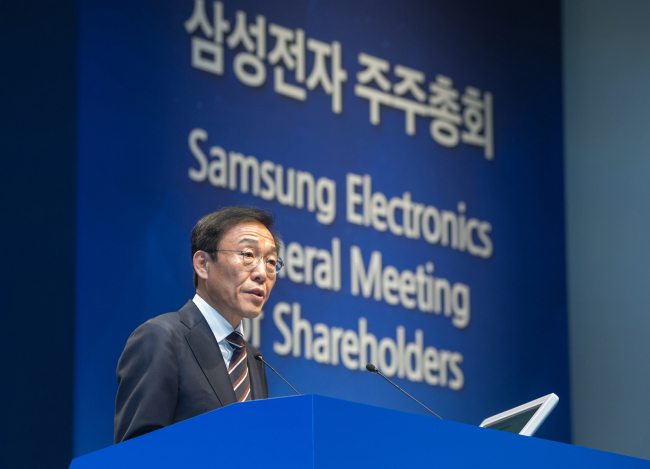 Some 1,000 shareholders attended the meeting held at the Seocho headquarters of the conglomerate, which was attended by Vice Chairman Kim Ki-nam, Kim Hyun-suk, chief of Samsung’s consumer electronics division, and Koh Dong-jin, CEO of Samsung’s IT & mobile communications unit, from 9 a.m. As many as 200 waiting shareholders could not fit into the 800-seat venue, leading to large protests and delays to the meeting. It was the first shareholders meeting after the stock split aimed at making it easier for retail investors to buy into the Korean tech giant early last year. After the split, the number of Samsung shareholders surged to about 780,000. Samsung said it plans to pay 9.6 trillion won ($8.5 billion) in dividends to shareholders this year, having completing a stock repurchase last year. The meeting dealt with presentations on business plans by the divisions of device solutions, consumer electronics and IT and mobile, along with the appointment of board members. Some shareholders, who appeared to be in their 20s and 30s, were seen proactively asking about Samsung’s preparations for a future that will be led by the fifth-generation network and artificial intelligence. Regarding the firm’s goal of attaining 20 percent market share in the 5G equipment market by 2022, Koh said mergers and acquisitions related to the next-generation technology are currently underway. In October, Samsung acquired Zhilabs, a 5G solution developer based in Spain. Explaining that Samsung’s 5G solutions ranging across equipment, devices and chipsets have been in development for 10 years, he added that the firm is working to win contracts in India, Japan and Europe. Another shareholder asked whether Samsung is conducting research on neuromorphic chips that will offer similar functions to the human brain in AI devices. Meanwhile, participating shareholders criticized the tech titan for the consistently low stock price following last year’s split. “The management hasn’t done enough to boost the stock price, while saying they are doing their best to enhance shareholder value since the stock split,” said one of the attendees. Vice Chairman Kim, who presided over the meeting for the first time, acknowledged the company’s share value has been weakening due to numerous external factors such as US rate hikes, ripple effects of the trade conflict between the United States and China and slow economic growth. “We believe some of these factors will be eliminated this year and will do our best to boost the share value,” Kim added. During the three-hour shareholders meeting, Samsung shares continued falling from the previous close at 43,900 won. However, shares closed by edging up 0.34 percent to 44,050 won. Of the three agenda items put to a vote, the appointment of three outside directors drew some criticism from shareholders. In particular, the reappointment of Bahk Jae-wan, a professor at Sungkyunkwan University and former finance minister, was questioned over his connections to Samsung. He has been an outside director since 2016. Four foreign pension funds with voting rights had expressed their objection to Bahk’s reappointment. A middle-aged shareholder who introduced himself as a resident of Masan, South Gyeongsang Province, expressed his anger at the board for not presenting the candidates for board members to the shareholders. Some demanded an apology from the board for making shareholders stand in an hourlong line and starting the meeting without their attendance. Later in the day, Samsung released a statement on its website apologizing for the inconvenience experienced by some shareholders.